The window display at Indochino. In the high-flying ’80s, Newbury Street boasted fur-clad models dining at the Armani Cafe, jet-setters shopping at stylish boutiques with Ferraris parked out front, and one-of-a-kind shops that lent a touch of Rodeo Drive to Boston’s staid brownstones. The street remains Boston’s most rarified, but a measure of that distinctive glamour has faded a bit in recent years as some of its one-of-kind boutiques closed and midprice chains encroached. That quaint Boston charm that still swathes places like Charles Street can be hard to find on nearby Newbury, where the atmosphere has touches of a high-priced shopping mall. But there is a move afoot to give Newbury Street a fresh gloss. Two big landlords are leading a push to restore the street’s cachet and reduce vacancy rates with an evolving mix of unique, high-end shops. The landlords are offering competitive rents and flexible lease arrangements for stores aimed at younger shoppers eager for new luxury options, whether it’s a $168 angler shirt or beard waxing at Ball and Buck, or a made-to-order three-piece suit (with pocket square) at Indochino. While some other streets have maintained a quaint Boston specialness, Newbury Street went from chichi to so-so. Smaller retailers and boutique chains are often more willing to take risks and to experiment with new shopping concepts. Many of the newest entrants on the street got their start in the online-only world but found they needed — or customers demanded — brick-and-mortar locations. 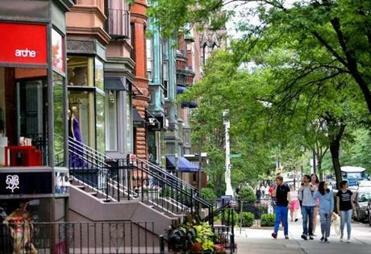 The increased visibility, particularly in places with Newbury Street’s reputation for sophistication, has been invaluable for them. The men’s clothing store Bonobos is a prime example. The 1,200-square-foot shop just off Newbury Street, at the corner of Dartmouth Street, has no inventory, because its shoppers select from in-store styles that are mailed to them from a distribution center at a Fort Devens industrial park. Appointments at Bonobos can be scheduled and guests are often greeted by sales associates, called “guides,” who offer clients a complimentary beer and help them select and fit $98 summer weight chinos and $85 shirts. Newbury Street is also a good incubator for up-and-coming retailers, with its bevy of 1,200- to 1,500-square-foot retail spaces in Victorian brownstones that were outfitted as retail shops in the 1920s and still have quirky walk-ups, or walk-downs, and uneven floors. The new and novel, of course, tend to attract young people, which could help reestablish the area as a destination for a new generation with its own shopping ethos. It’s the kind of shopper that Charles Street, a haven for estate jewelry and distinctly preppy clothiers, has never fully cultivated. The shop is one of 18 in the United States, in a space that had previously been vacant and occasionally occupied by temporary pop-up vendors. Once-empty storefronts on Newbury Street have increasingly become occupied: The vacancy rate is 3.7 percent, according to Cushman & Wakefield, down from 8.8 percent in 2009, post-recession. In 2012, Jamestown, which is based in Atlanta and New York, bought much of its Newbury Street real estate portfolio from UrbanMeritage for $226 million. At the time, the properties were about 75 percent leased, compared with 95 percent today. The company takes much of the credit for the retail upgrade that’s underway. But so does Boston-based UrbanMeritage, which notes that it signed many of the leases that paved the way for new ideas. Ani Collum, a partner at the Norwell consultancy Retail Concepts, said that either way, fresh concepts are smart, but they must keep coming if the street is going to find its soul again amid what had become a hodgepodge of random retailers. “If you have some people that are doing interesting things and creating some buzz, it’s good; there just needs to be more of them,” Collum said. All Too Human, an airy, whitewalled boutique featuring emerging artists and fashion designers, might just be the buzziest thing happening on the new Newbury Street, promising a return to one-of-kind high style that LouisBoston once embodied. Just off Newbury Street at 236 Clarendon, All Too Human quietly opened this spring and rotates its collection every two months. There are mannequins sheathed in silk jumpsuits, black pumps with mismatched chunky heels, and a line of home furnishings in exotic animal skins. Of the 35 designers on view, only two are currently sold elsewhere in Boston, said cofounder Jessica Knez, a Tufts University graduate who spent the past six years working in New York at Lord & Taylor and Bergdorf Goodman. And she is also part of the online commerce world, offering her wares on Farfetch.com, a British website that curates luxury boutiques. UrbanMeritage, the Boston real estate investment firm, continues to have a strong presence on the strip, and principal Michael Jammen said the firm has been willing to offer leasing arrangements to new and unusual retailers that can bring flair. Neither UrbanMeritage nor Jamestown would discuss the specifics of any lease. 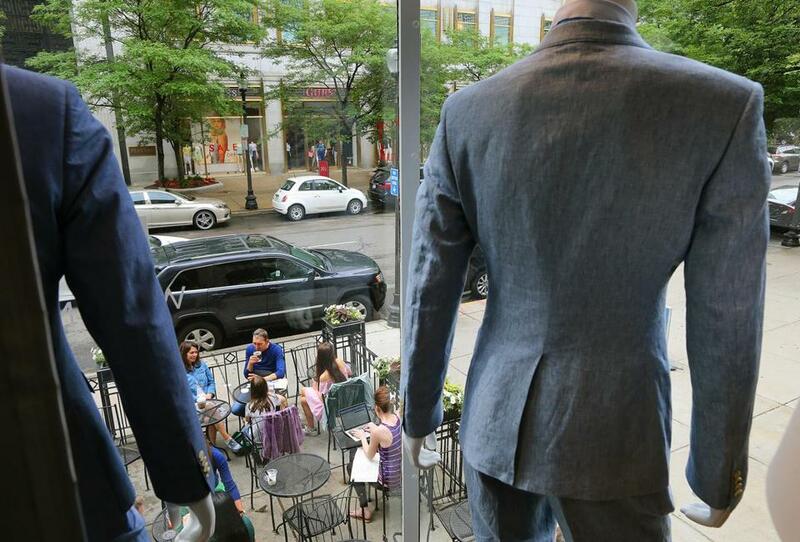 Next year, UrbanMeritage will bring in Suitsupply, a Dutch retailer known for unconventional retail locations and edgy marketing campaigns, to a 10,000-square-foot store in the former space of Ciao Bella near Fairfield Street. The shop, due to open in July 2017, will feature a restaurant with a liquor license, in an effort to broaden its appeal. More recently, the company introduced Alice and Olivia, a US-based retailer launched in 2002 at Barney’s in New York, to Newbury Street, with its 20th store opening last week in one of the developer’s storefronts. But you won’t find it in the mall in Natick. Jammen said. The next-closest location is tony Greenwich, Conn.
can be reached at megan.woolhouse@globe.com. Follow her on Twitter @megwoolhouse.